Rain was in the forecast for this afternoon, 40% chance after 2PM. I was getting 40% all over me by 1PM, but it didn't slow me down much, or even get me very wet, because I put on my trusty poncho quickly. Today's hike covered ground with three access points to the Blue Ridge Parkway, and I parked at all three, so hiked fairly short legs of trail with a very light pack. The plan was to also stay dry by ducking back into my two-ton steel tent when the rain hit. But it hit when I was four miles down the trail, (and it ended soon after I got back 'home'). So much for that plan. 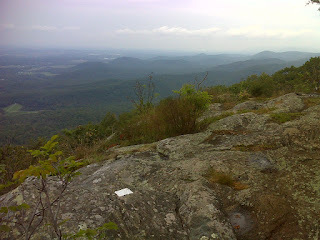 Hard to believe that I'm almost to Rockfish Gap and will be hiking in Shenandoah National Park by Sunday. The miles just seem to be melting away.